Afterward, I drove across the state to visit family in Vero Beach. That's where I went to an art show and discovered the two whimsical images above by artist Kenneth Dames. (They are reproduced here with Dr. Dames' permission.) With all the conversations of the previous few days, the poses in both of Dames' images reminded me of the way technology has changed how U.S. consumers interact with the news. See how the newspaper reader on the left is relaxed, legs crossed, settled in for a leisurely read. 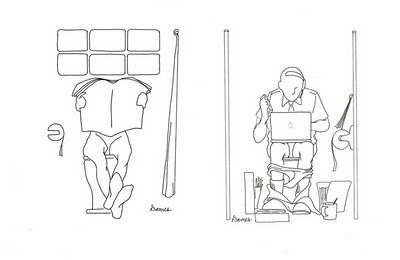 The person on the right is multitasking, leaning forward into the laptop screen while juggling a mobile phone. The multitasker is a perfect stand-in for the busy, workday user that has dominated most American news sites' Web traffic for a decade and a half. The familiar track of hourly online page views curves up steeply with the start of the East Coast workday, levels off by mid-morning on its way to a lunch-break peak, before sloping off at quitting time. The end-of-the-day slope has been steep for sites based in the east, and more gradual for those with many West Coast users. Weekends were as dependably flat as a drive across central Florida. Now, after years of predictability, those patterns are shifting slightly. The rise of home broadband access and social media seem to be manifesting in increasing evening and weekend traffic for some news sites. And the mobile Web's long-awaited appearance in the United States is creating different online audiences during the commuting hours and on weekend days as well. The question of the moment is whether the latest e-readers -- iPads, Nooks, Kindles and the like -- will create yet another kind of user, one who is more like the newspaper reader pictured on the left. These gizmos are quite different from smart phones, netbooks and other portable tools, all of which have workday if not at-work uses. You can steal glances at an iPhone during a meeting and no one would know if you were checking e-mails from the boss or toying with a favorite site or app. Haul out a 10-by-8-inch, pound-and-a-half iPad and you might as well just start flipping through the latest issue of Entertainment Weekly or Southern Living at the board room table. E-readers are for living rooms, coffee shops and park benches. They are for people who have time to read and listen and browse and savor. If they take hold with large numbers of people, news sites might once again begin see changing user patterns -- with longer time-on-site numbers, growing page-per-visit counts, and increased traffic at traditionally off hours. And those patterns will in turn change the way online news managers program, present and perhaps even schedule their content. Rather than echoing story selections aimed at serving the grazing habits of workplace news skimmers, media sites may find that their e-reader users are in the mood for a more contemplative, transportive or analytical experience. As it happens, NPR (my employer) announced plans for launching an iPad-friendly version of our Web site and a related app earlier this week. "Audience is strategy," a panelist told our group of media managers at last week's Poynter seminar. But no matter which audience you belong to, please wash your hands before returning to your work computer. A quest for tips, trends and tools from the worlds of tomorrow. Mark is the former managing editor for digital news at NPR. The Assignment: Future blog began as an offshoot of the "Futurist" column Mark previously wrote for CQ Weekly and a technology column and newsletter he wrote for Congressional Quarterly's GOVERNING magazine. The blurry crystal ball Mark uses here now is his alone. He also is at work on a Washington novel with writer Eric Scott MacDicken, with whom he worked on Office Opossums.